Each weekday before the DCI 2005 Classic Countdown, we'll be running first-person accounts of the seasons and the shows that will be featured in that event. Here's the seventh installment: While I spent four years with the Cavaliers, I think that drum corps is an absolutely silly activity when you stop and really give it some thought. It's one that I've been known to group up in a category with show choirs, lawn darts, Dance Dance Revolution and Jell-O wrestling. Because of this, I'm not the type of person who can watch hours upon hours of drum corps DVDs or roll my car windows down with the best of the 1980s blasting. Anyway, I don't think my four-speaker Toyota sound system could handle those powerhouse horn lines, and could you imagine the mess left on the sidewalk when a random pedestrian walked by my car only to have his face ripped off? 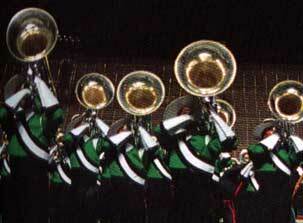 The Cavaliers contra line in 2002. Despite all of this, the 2002 Cavaliers "Frameworks" show is one that I admit I consistently watch. If I'm in the mood for what people like to call a "drum corps fix," or if a new friend or coworker wants to know what drum corps is all about, the 2002 Cavaliers DVD is the one I would be keeping out of the case in a five-disk changer if I had one. I suppose the conflict of interest I face is that if I can't handle large doses of drum corps, how could I possibly sit through repeated viewings of this particular show? It would be easy to classify it as a third straight DCI title, a record high score with numerous caption awards, an undefeated season and guard uniforms that looked like something Cesario ripped off of the back lot of the 1982 sci-fi classic "Tron." All of those, however, come secondary to me. To tell the truth, I couldn't even tell you that record score from 2002 much less our finals score for any of the years I marched. I'm oblivious to them all, even the one that put us behind the Blue Devils when I had to give the second place salute as drum major in 2003. Ninety-nine point something or other is what I like to tell people we earned in 2002. I feel like I don't need those scores to reaffirm my interest in the activity. Probably a lot of people who go through the drum corps experience will agree that the season doesn't end up about scores, placements and the closest competition, rather the stupid things that happened with your buddies along the way. Things like the number of times you successfully plunged a backed-up school toilet, the Broadway shadow puppet show you co-wrote and produced on the gym wall after lights out with your flashlight, or the conversation you had on the bus about friends, family, religion, politics or a combination of them all. When I pulled out the 2002 DVD again when I was asked to write this column, I was flooded with a collection of memories, including some I probably haven't had since I jumped in the car on the way home from Madison that summer. Naturally, a lot of them focus on the show, but some of them are the completely offbeat and random remembrances that consistently make me laugh and smile. Movement I, "Melody" We learned a good amount of the opener in early June during pre-tour in Newark, Ill. Understand that Newark is a typical booming metropolis of sorts situated in the heart of Illinois smack in the middle of rural highways and byways, cornfields and grain silos. Every year we stop by for about a week to practice at the local high school that consequently backs up to a residential area. "Harmony" has a lot of great horn and drum parts running a gamut from the quietest pianissimo to forte and louder at the big hits. Of course pre-tour brings with it long rehearsal days into the nighttime with instructors who try to squeeze every last minute from the clock in an effort to put the show on the field for the first show. So when our rehearsals starting going from a 9 p.m., to a 9:15 p.m., to a 9:30 end time, we started to anger at least one of the locals in particular. This resident must have had sensitive ears or didn't appreciate the sense of patriotism that a 64-member horn line can instill, because she decided to start an impressive grassroots, "Stop the Marching Bands" campaign among the neighbors. This came complete with signs with slashes through a cartoon marching band person, flyers, and leaflets with phone numbers to call, including the school's superintendent and sheriff's office to report any noise past 9 p.m. Fortunately we weren't around long enough for these peaceful protest activists to start a picket line or for CNN to pick up on the action, but we all had a pretty good laugh about this. We even were able to get ahold of one of the leaflets that we hung throughout the season up in the front of the horn bus. As a happy ending, I think the corps office was even nice enough to send that disgruntled neighbor a Christmas card that year to soften any ill feelings, even though I think she moved away from Newark before our return in 2003. Hopefully with her unfortunate departure, though still small in size, Newark might possibly be a tad less small-minded. Movement II, "Harmony" Eric Baker, a lead trumpet from 2000 to 2003, is the subject of one of my favorite memories from this movement. At the end of the opener the horn line dissipates across the entire field, and on side two around the 25-yard line (the right side of the field from the stands) a lone trumpet player sounds a note before the entire trumpet section entrance. That was Baker's second solo of the show for which he was positioned facing left toward the end zone. I think there was an ulterior motive for creating that solo so everyone could clue into his intonation, but for his lead trumpet ego, I'll classify it as the most important trumpet note in the history of drum corps and say that we couldn't have lived without it. I can only imagine exactly what would be going through his head in the moments before he had to start that note. I, as a career third trumpet, have never even had the luxury to imagine what it would be like to play a solo in a drum corps performance. I like to worry, so I'd probably be thinking along the lines of: "Wouldn't it be awful if I crack this note." "Wow I'm tired. I hope I don't hack up a lung through my trumpet bell." "Hope I'm in tune so I don't end up all over the front page of Drum Corps Planet." It was only sometime later in the season that we found out at the regional shows, Baker admitted he was using his advantageous position facing the end zone not to think about his entrance or tone quality, rather to check out the action and himself on the JumboTron. Movement III, "Rhythm" I'd say that movement three is the most entertaining section of "Frameworks," with typical breakneck Cavalier drill moves along with intricate guard work and a technical percussion book to boot. Probably the most well-known part of that movement, however, is the "Fight Club" sequence at the end. The name "Fight Club" was an in-house creation that one of the members came up with probably about a quarter of the way through the season. It was almost too bad that name stuck, though, because I was having a good time hearing what "journalists" and fans alike were calling it. We heard anything and everything from, "the third movement's counting, running and fighting section," to "the third movement concluded with an enthusiastic jig." I'm OK with the "Fight Club" label, but I like to think of it in terms of a combination of the positive affirmation of Sylvester Stallone reaching the top of the stairs of the Philadelphia Museum of Art, the fitness styling of Billy Blanks' Tae Boe, and the primal rage of Mike Tyson biting Evander Holyfield's ear off. At the time, that section seemed like the greatest visual culmination of drill and body movement in all of drum corps. Now I can't watch it without laughing hysterically. To take it out of context of that show and to put it, for example, right before James Bond saved the world during the Cavaliers' 2004 production, or following "Jupiter" in 1995, seems absolutely ridiculous, but for whatever reason it had the perfect place in the 2002 show. In retrospect, I guess it was cool enough to have more than a handful of marching bands doing similar choreography in their shows during the fall. Still, I sometimes wonder if guard designer Andy Toth had called for the "Macarena" or had us doing the "Slappin' Leather" country line dance there, if the crowd still would have gone crazy. Movement IV "???" If the aerobic workout 10 minutes into the program wasn't enough during "Fight Club," we still had the fourth movement to get through after that. A good piece of trivia to impress your friends is that between the third and the fourth movement is the only section during "Frameworks" that all action stops. It's only for about five or six seconds for applause, but everything up until then was a continuous flow of music and visual. I wish I could mention the name of the fourth movement, but I'm not sure that it ever had one. I always liked to explain it as the culmination of melody, harmony and rhythm. If I had to come up with a name, I would call it something like "Equilibrium," which is the first thing that came up when I just Googled "melody, harmony and rhythm." But after mulling that over for a bit, I am actually surprised at how well that title could fit the fourth. Even compared to the 2001 "Four Corners" production, where we marched faster than 200 beats per minute for half the show, I always thought that "Frameworks" was incredibly difficult to get through. By the fourth movement, we had already been hop, skipping and jumping in the opener, doing "Swan Lake" ballet in the second, executing squats and deep knee bends in the third, and all of that even before the push to the end. Coming out of the "Fight Club" sequence, watch the guys in the back of the rotating circular picture frame. That was my area. We were trucking across half the field -- 30-yard line to 30-yard line in something like 16 counts -- and I'll admit that there were times I thought I'd collapse because I couldn't feel my legs anymore. During those 16 counts, is where we needed to find our equilibrium. If anything would hold us back that year, it would be the physical strain of the fourth movement. We probably ran more repetitions of that movement to put it under our feet and to build endurance than we did any other part of the show that summer. Even after specifically working on deep and cleansing yoga breaths to calm us down, it was hard to find the balance needed to not be gasping for air like a trout on a sidewalk. I actually feel kind of horrible admitting that I was so tired throughout, considering that I was only lugging around a trumpet that weighed a couple pounds. If you want to see some of the hardest working members of the Cavaliers from 2002, check out the tubas at the front of the block in the reprise of "Fight Club" at the end of the show. They fling those things around like they are piccolos. In the end, however, I do think we tapped into our Zen, found our equilibrium and did our best to overcome the rigors of the fourth movement, putting the perfect capstone on an incredibly designed show with equally incredible performers, and not to forget extremely receptive and encouraging audiences. ****** I'm back to trying to figure out why, when I watch drum corps or show someone who has never seen the activity before, do I use the Cavaliers 2002 "Frameworks" production as my example? First of all, the show is built around a relatively simple concept for people to understand: The Elements of music melody, harmony and rhythm. Secondly, I'd say that this show is one of the best pieces of evidence for the ever-popular drum corps debate of art versus sport. This show represents a high-quality blend of musicianship and entertainment value with an incredible amount of athleticism to take it over the edge. It probably didn't hurt us either that 2002 was just a great year to march in the Cavaliers. We had a great group of talented members that all got along well, a great set of laid-back leaders in place, and a great design team and show to act as the vehicle to take us through to the end. Do I still think drum corps is a completely silly activity? Yes, but like anyone, I wouldn't trade my experience for anything. I think it is an incredible activity beyond the gossip of what corps is wearing what uniform and whose blattamaphones play louder than whose frooglematoons. I take a lot of joy and pride in saying to people, "Drum corps is made up of X, Y, and Z, and of course I know it's ridiculous to run around a football field in tight pants and to sleep on a gym floor. Beyond the sillyness, however, the experience I had and the people who I met along the way are absolutely incredible." Maybe someone can give me a recommendation of what drum corps show to blast while driving with the windows down, since the Chicago weather has really started to look good in the last couple weeks. I'm not going to guarantee I'll like it or be doing that more than once at this point in my life, but I'll give you a call when my time has come that we can sit down, compare notes and have a great chat about when drum corps was really drum corps. Chris Weber is DCI's new marketing and promotions coordinator, beginning Monday, April 18.